This charming, detached holiday home with private swimming pool is situated just outside Félines-Minervois, in an old mountain range, which is part of the Parc Régional du Haut Languedoc. The house features a spacious living room and a fully equipped open plan kitchen/dining area. Both the dining area and the lounge have French doors providing access to the terrace. Here, you'll find some nice teak garden furniture and a parasol, making it a perfect place to sit and eat together. The terrace offers a view of the swimming pool and the beautiful, hilly landscape. There's a bedroom and a bathroom on the ground floor. There's an additional sleeping area upstairs, which is separated into a a few smaller spaces by some wardrobes. In the garden, you'll find the swimming pool, surrounded by a large terrace with sunbeds. 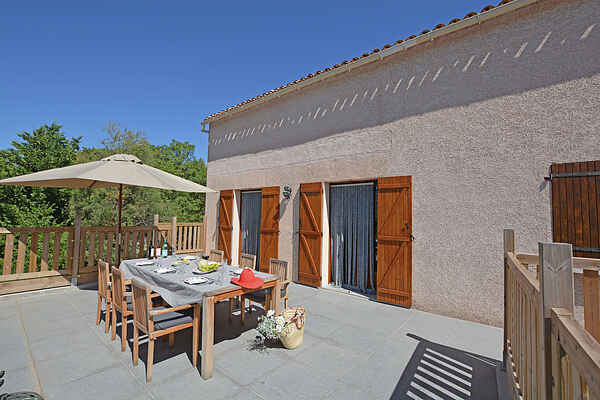 And the boules court in the fully enclosed, sunny garden will let you experience that wonderful French holiday feeling. You can get your daily groceries or go out for a bite to eat in wine village Félines-Minervois. Carcassonne and Narbonne are only 30 km away. If you fancy a day at the beach, you'll find Narbonne Plage at the same distance. If you'd like to go sailing for a day, you can go to the magnificent Canal du Midi (15 km).